Strictly speaking, the 1st Lord Baltimore wasn’t really Irish, although he was a member of the Irish peerage, had an Irish title and and resided on his Irish estates shortly before travelling to the Americas to set up his first colony in Newfoundland. He died just after acquiring the charter for Maryland. The 1st Lord Baltimore (George Calvert) is best known as an English politician who achieved domestic political success as a Member of Parliament and later Secretary of State under King James I. It could also be argued that he wasn’t English either because his family originally came from Flanders (a Dutch-speaking area today across the English Channel in modern-day Kingdom of Belgium). As Sir Robert Cecil rose, Calvert rose with him. In 1613, the King commissioned Calvert to investigate Roman Catholic grievances in Ireland, along with Sir Humphrey Wynch, Sir Charles Cornwallis and Sir Roger Wilbraham. Most people know about the Plantation of Ulster (starting in 1609) and the estates granted to the London Livery Companies but there were other plantations under James I (1619-20) and they covered vast tracts of land and displaced many thousands of families, and deprived them of the livelihoods. In addition to ‘collectively punishing’ those who rebelled against his predecessor, Queen Elizabeth I, James also implemented a ‘legal’ policy of breaking up Irish Catholic estates elsewhere – especially the Gaelic Irish estates. Since most of the ‘Old English’ land-owning families in Ireland had taken their estates by force in the previous four hundred years, very few of them, with the exception of the ‘New English’ planters, had proper legal titles for them. As a result, in order to obtain such titles, they were required to forfeit a quarter of their lands to the Crown. Anyone who resisted, lost everything and this was a major contributory factor of the Great Rebelion of 1641. 1610 Wexford – where lands were confiscated from the MacMurrough-Kavanagh clan. 1619-20 Offaly – the Gaelic lordships in west Offaly—Ely O’Carroll, Delvin MacCoughlan, Ferceall and Fox’s Country fell outside of the original 16th C plantation. In this scheme, 25% of existing holdings passed into planters’ hands and the remaining 75% were re-granted to native landholders (with conditions). Existing Irish boroughs lost their city-state status and were transformed into ordinary municipal towns on the English model: debarred from pursuing an independent trade or foreign policy; obliged to conform to some degree to the established church; and compelled to remit their revenue from tolls and customs to the Crown, thus ending their financial autonomy. Medieval towns such as Tralee, Sligo and Cavan, and ancient episcopal sees like Armagh, Clogher and Tuam, were rejuvenated and their economic role promoted. In 1611 Sir George Carew (1555–1629), the former president of Munster, was sent to Ireland to investigate the main problems facing the government there. Carew’s solution was simple but effective: new boroughs under firm Protestant control should be created to manufacture a Protestant majority in the Irish Parliament — 8 in Munster, 4 in Leinster, 4 in Connacht and 22 in Ulster. Without these new creations Catholics would outnumber Protestants by 85 to 61 in the Commons overall, and by 52 to 28 for the boroughs. On the other hand, the new creations would result in Protestants outnumbering Catholics by 123 to 95. Not all of the early 17th century English Planters were Protestants. A considerable number of English Catholics settled in Ireland between 1603–1641, in part for economic reasons but also to escape persecution in England. In the time of Elizabeth and James I, the Catholics of England suffered a greater degree of persecution than English Catholics in Ireland. In England, Catholics were greatly outnumbered by Protestants and lived under constant fear of betrayal by their fellows. In Ireland they could blend in with the local majority-Catholic population in a way that was not possible in England. English Catholic planters were most common in County Kilkenny, where they may have made up half of all the English and Scottish planters to arrive in this region. The sons and grandsons of these English planters played a major part in the politics of the Confederation of Kilkenny in the 1640s, most notably James Tuchet, 3rd Earl of Castlehaven. Failed Politican and Secret Catholic? The Catholic Calvert household suffered the intrusion of the Elizabethan-era religious laws. From the year of George’s birth onwards, his father, Leonard Calvert was subjected to repeated harassment by the Yorkshire authorities, who in 1580 extracted a promise of conformity from him, compelling his attendance at the Church of England services, i.e. they were forced to convert to Anglicanism. During these times, many Catholics converted in order to improve their economic and.or political career prospects – a trend that was continued in Ireland up until the 18th C – where they are collectively known as the ‘improvenatii’ by some historians. Calvert lost much of his political power after his support for a failed marriage alliance between Prince Charles (later to become King Charles I) and the Catholic Spanish House of Habsburg royal family. As the chief parliamentary spokesman for an abandoned policy, Calvert no longer served a useful purpose to the English Royal Court, and by February 1624 his duties had been restricted to placating the Spanish ambassador. The degree of his disfavour was shown when he was reprimanded for supposedly delaying diplomatic letters. Rather than continue in politics, he resigned all of his political offices in 1625 except for his position on the Privy Council and declared his Catholicism publicly – a dangerous move in those days. When King James I (and VI of Scotland) died in March 1625, his successor King Charles I maintained Calvert’s barony but not his previous place on the Privy Council. Calvert then turned his attention to his Irish estates and his overseas investments. He was briefly recalled to court and renewed his rights over the silk-import duties, which had lapsed with the death of James I and secured Charles’ blessing for his venture in the “New Found Land”. Unusually, for an estate of this size, we still don’t know where Baltimore, Co. Longford is ! Part of the reason for the political downfall of Calvert was his Catholicism, or at least his tolerance of it at a time when tolerance was in vogue. but the connection between Calvert’s resignation and his conversion to Roman Catholicism was a complex one. 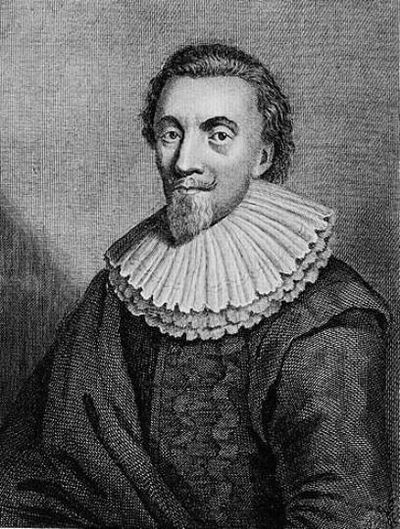 George Cottington, a former employee of Calvert, suggested in 1628 that Calvert’s conversion had been in progress a long time before it was made public. George Abbot, (1562-1633), the reigning Archbishop of Canterbury, (and ecclesiastical head of the independent Church of England), reported that political opposition to Calvert, combined with his loss of office, had “made him discontented and, as the saying is,“Desperatio facit monachum”, so hee apparently did turne papist, which hee now professeth, this being the third time that he hath bene to blame that way [sic]”. Godfrey Goodman, the Bishop of Gloucester, later claimed Calvert had been a secret Catholic all along (“infinitely addicted to the Catholic faith”), which explained his support for lenient policies towards Catholics and for the Spanish match. However, no one had questioned Calvert’s conformity at the time, and if he had indeed been secretly Catholic, he had hidden it well. His plans were disrupted by the death of King James I, and by the crackdown on Catholics with which King Charles I began his reign in order to appease his opponents. The new King required all privy councillors to take the oaths of supremacy and allegiance; and since Baltimore, as a Catholic, had to refuse, he was obliged to step down from that cherished office. Calvert had long maintained an interest in the exploration and settlement of the New World, beginning with his investment of twenty-five pounds in the second Virginia Company in 1609, and a few months later a more substantial sum in the East India Company, which he increased in 1614. In 1620, Calvert purchased a tract of land in Newfoundland from Sir William Vaughan, (1575-1641), a Welsh writer and colonial investor, who had earlier failed to establish a colony on the large sub-Arctic island off the eastern coast of North America. He named the area of the peninsula as Avalon, after the legendary spot where Christianity was supposedly introduced to Roman Britain in ancient times. The plantation lay on what is now called the Avalon Peninsula and included the fishing station at “Ferryland”. Calvert took an interest in the British colonisation of the Americas, at first for commercial reasons and later to create a refuge for English Catholics. He became the proprietor of Avalon, the first sustained English settlement on the southeastern peninsula on the island of Newfoundland (off the eastern coast of modern Canada). Discouraged by its cold and sometimes inhospitable climate and the sufferings of the settlers, Sir George Calvert looked for a more suitable spot further south and sought a new royal charter to settle the region, which would become the state of Maryland. In late September or October 1629, Baltimore arrived in Jamestown, where the Virginians, who suspected him of designs on some of their territory and vehemently opposed Catholicism, gave him a cool welcome. They gave him the oaths of supremacy and allegiance, which he refused to take, so they ordered him to leave. Sir George Calvert, 1st Baron Baltimore, died five weeks before the new Charter was sealed, leaving the settlement of the Maryland colony to his son Cecil, 2nd Baron Baltimore (1605-1675). At the time of his birth, his father was under pressure for conformity, and all ten children were baptised as Christians in the Anglican (Protestant) tradition. Before he died, George Calvert converted back to Catholocism and his male children seemed to have quickly followed him. As an English Roman Catholic, he continued the legacy of his father by promoting religious tolerance in the colony. Maryland thus became a haven for Catholics in the New World, particularly important at a time of religious persecution in England. On June 20, 1632, Cecil, 2nd Baron Baltimore executed the charter for the colony of Maryland that his father had negotiated. 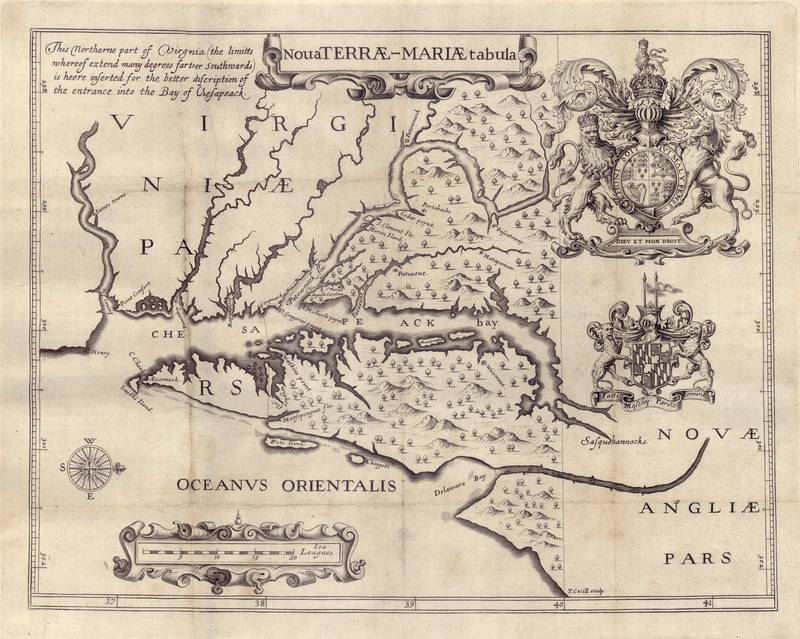 Calvert received a Charter from Charles I of England for the new colony of Maryland, to be named for the Queen Consort Henrietta Maria (wife of King Charles). The original grant would have included the western shore of the Chesapeake Bay as far south as the Potomac River and the entirety of the eastern shore (future “Delmarva” peninsula). When the Crown realised that settlers from Virginia had already crossed the Bay to begin settling the southern tip of their eastern shore, the grant was revised to include the eastern shore only as far south as a line drawn east from the mouth of the Potomac River (including the future State of Delaware). Once that alteration was made, the final charter was confirmed on 20 June 1632. This charter would be heavily contested by Calvert’s heirs and the Penn family in the Penn–Calvert Boundary Dispute. The title of “absolute ownership” and “ecclesiastical as well as civil” would become very important the 2nd Lord Baltimore was defending a charge of “illegal export of silver” and “illegal coining” in 1659 and 1662, respectively. 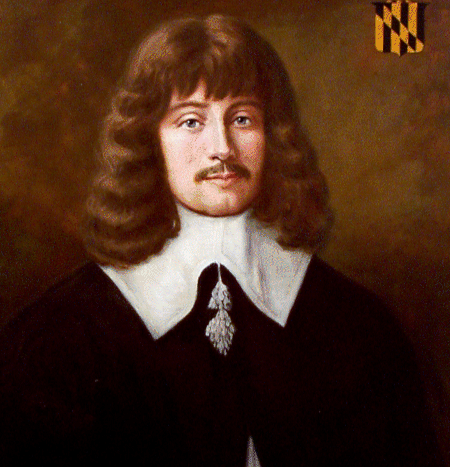 George Calvert’s second son, Leonard Calvert, (1606-1647), became the first colonial governor of the Province of Maryland. Supporters in England of the Virginia colony opposed the Charter, as they had little interest in having a competing colony to the north. Rather than going to the colony himself, Baltimore stayed behind in England to deal with the political threat and sent his next younger brother Leonard in his stead. The first expedition (1634) comprised two ships (formerly owned by Baltimore’s father George), the “Ark” and “Dove.” They departed from Gravesend in Kent with 128 settlers on board. They were chased and forced to return by the British Royal Navy so that the settlers would take an oath of allegiance to the King as required by law. They then sailed in October 1632 for the Isle of Wight to pick up more settlers. There, two Jesuit priests (including Father Andrew White) and nearly 200 more settlers boarded before the ships set out across the Atlantic Ocean. Lord Baltimore sent detailed instructions for the governance of the colony. He directed his brother to seek information about those who had tried to thwart the colony and he also emphasised the importance of religious toleration among the colonists, who numbered nearly equally Catholic and Protestant. The enterprise took place in the context of serious unrest in England. In 1629, King Charles I had dissolved Parliament and governed for the next eleven years without consultation from any representative body. In 1649, Maryland passed the Maryland Toleration Act, also known as the “Act Concerning Religion”, mandating religious tolerance for Trinitarian Christians only (those who profess faith in the “Holy Trinity” – Father, Son and Holy Spirit, excluding Nontrinitarian faiths). Passed on 21 September 1649, by the General Assembly of the Maryland colony, it was the first law establishing religious tolerance in the British North American colonies. The Calvert family sought enactment of the law to protect Catholic settlers and Nonconformist Protestants who did not conform to the established state Church of England. Cecil Calvert, or 2nd Lord Baltimore, was born in Kent (8 August 1605) and, when his mother Anne Mynne (or Mayne) died in 1622, his father and his children openly converted to Catholicism. The family moved to Ireland in 1625 but when Cecil married Anne Arundell, daughter of the 1st Baron Arundell of Wardour, in 1627 or 1628, it is likely he was by then living in London. Of the nine, only three, including Charles Calvert, 3rd Baron Baltimore, survived to adulthood. In 1628 Cecil accompanied his father, along with most of his siblings and his stepmother, to the new colony of Newfoundland. The colony failed due to disease, extreme cold and attacks by the French and the family returned to England. His step-mother was drowned on the return trip and this may have hastened his father’s death. 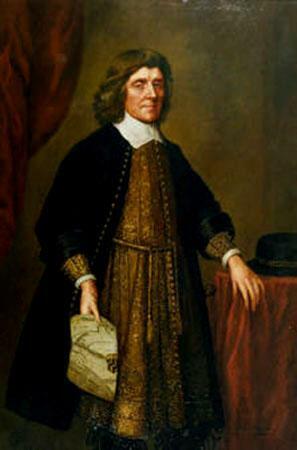 Cecil Calvert inherited his father’s colony of Maryland in 1632. The so-called Lord Baltimore coinage of Maryland occupies an important position in the very early coinage of North America’s Colonial era. The Maryland groat (fourpence), sixpence, and shilling were contemporaneous with the silver coinage in the nearby Massachusetts colony, but are much scarcer, since the Maryland pieces were struck only for a comparatively short period of time. Most controversially, at the time, they did not display the portrait of any king, since Charles I had been beheaded in 1649 and Charles II would not ascend to the throne until 1660, i.e. they were first produced during the Interregnum (or gap in the monarchy) and during the Commonwealth period – a failed republican experiment in England. On October 16, 1659, Cecil Calvert sent a letter to his brother Philip Calvert in Maryland along with samples of a new “Maryland money” that he intended to circulate in the colony. Shortly after this letter arrived, the governor of the colony, Josias Fendall, led an unsuccessful attempt to overthrow Calvert. This immediate threat pushed the coinage issue into the background. By November 1660 the rebellion was crushed and Philip Calvert assumed the governorship. He soon took up the coinage legislation which the Maryland Assembly initially resisted, but on April 17, 1661, an act was passed that authorized the establishment of a mint to strike coins. The following year, an act was passed that required every taxable person in Maryland to exchange 60 pounds of tobacco for 10 shillings of the new coins. The Lord Baltimore coinage denominations included the denarium (penny) copper patterns, along with silver groats (four pence), sixpence, and shillings (twelve pence), struck at London’s Tower Mint (or by employees thereof at its facilities) at the behest of Lord Baltimore for shipment to and use in Maryland. The obverse of the coins depicted the bust of Lord Calvert, with the legend + CAECILIVS : DNS: TERRAE – MARIAE : & CT . on the shilling (with the final T left off the smaller sized denominations). The reverse of the silver denominations displayed the family shield with a palatine coronet above and the denomination in roman numerals to either side of the shield (either X II, V I or I V) and the legend CRESCITE : ET : MVLTIPLICAMINI . (Increase and be multiplied). Prior to the introduction of these coins, weights of tobacco, musket balls and gunpowder were used as ‘bartering’ currency but sharp fluctuations in their relative values made the introduction of coinage a necessity. Lord Baltimore, despite the plenipotentiary rights and powers conferred upon him by the royal charter, was neither specifically granted nor enjoined from the right to coin money, but in any case an action was taken against him by Richard Pight, Clerk of the Irons of the Tower Mint, and he was summoned to appear before the Privy Council. The objections were mainly of two kinds. First, the silver coinage was being exported from England during the interregnum of Oliver Cromwell (a period from 1649 to 1660 when there was no monarch and England was nearly insolvent). Second, the silver coinage failed to comply with the English standard, an impossibility which would have made the coins overweight in Maryland (where all commodities, save tobacco, were scarce) and subject to melting. No disciplinary action appears to have been taken by the Privy Council, however. Calvert overcame numerous objections both in England and in Maryland to his coinage, and by 1662 a mandatory exchange of tobacco for coinage finally propelled the silver Lord Baltimore pieces into circulation. Calvert may have assumed he had coining rights because the Bishop of Durham had produced coins, and his father’s original charter was comparable to that of a medieval bishophic. The ‘Clerke of the Irons’ in the Tower, who was also holder of a Puritan Commonwealth commission against false coiners, obtained a warrant for Calvert’s arrest and seized his tools and remaining coins. the use of the abbreviation “DNS” for Dominus or “Lord,” a monetary usurpation of the rights of the English monarchs to strike coinage. At the time the Lord Baltimore coinage was struck at the Tower Mint, apparently sometime between May and October 1659 (and perhaps on more than one occasion), there was effectively no head of government in England. The silver content of the Lord Baltimore coins was more problematic than the image that they bore, as the coins were struck of sterling silver but contained less net silver than their English counterparts — the infrequently struck English fourpence were of lower fineness but higher silver content. Such a high silver content for the Lord Baltimore coins would have been impossible in Maryland, where silver was at an appreciable premium compared to its price in England at the time, and in fact virtually every commodity besides tobacco was scarce. Lord Calvert was actually arrested in October, 1659, in London, for the illegal export of silver from England to his Maryland colony. Though no official records exist of his adjudication, it is presumed that an arrangement was made for him to keep the coins in question and transport them home, where the silver pieces circulated extensively. We do not know how Calvert got out of this sticky situation, but he lived until 1675. Calvert might have escaped lasting punishment but no more coins were struck for his colony. The state of Maryland is one of only two among the “original 13” that was controlled directly by the same family at the time of its foundation and the beginning of the American Revolution. (Pennsylvania is the other.) Both families have Irish connections. After the Glorious Revolution the 3rd Baron Baltimore lost his proprietorship because he had supported the Catholic James II, i.e. the losing side in the Williamite Wars. The 4th Baron Baltimore petitioned for his claim to be restored, but in another near-miss he died before receiving royal assent and the 5th Baron Baltimore took up the proprietorship instead. It then passed to the 6th (and last) Baron Baltimore and finally to Henry Harford. Harford was the 6th Baron Baltimore’s only son, but by a mistress; due to his illegitimacy, Harford was eligible to inherit the proprietorship but not his father’s title. Henry Harford was still in his teens when the American Revolution broke out, depriving him of the proprietorship once and for all. The extremely rare Lord Baltimore Maryland Penny, or Denarium, is known by only eight or so examples. There is some speculation that these pieces were patterns, but other evidence, including wear on some specimens and one piece recovered by a metal detector, indicates that they might have actually circulated for some considerable time. However, a 1671 account of Maryland commerce mentions only “groats, sixpences, and shillings … which his Lordship at his own expense caused to be coined” along with barter and English and other foreign coins as the principal means of exchange. This would suggest that the denarium or penny coins struck in copper were strictly a pattern issue. The legend reinforces that the coinage was a proclamation of Lord Baltimore’s sovereignty as well as an apparent commercial necessity. Reverse: A ducal coronet appears in the center with two pennons flying, the legend DENARIUM TERRAE-MARIAE (“denarius of Mary’s land”) encircling the periphery. The reverse design is substantially different from the Maryland silver coins. Throughout these descriptions, the modern letter U is used, rather than the archaic V that appears in its place on these coins. DENARIVM = DENARIUM, CAECILIVS = CAECILIUS, MVLTIPLICAMINI = MULTIPLICAMINI. Two varieties of Lord Baltimore Maryland Groat (fourpence) are known: a unique Small Bust variant and the Large Bust variety (shown above). Examples are known in a wide range of grades, which suggests that these coins saw circulation over an extended period in Maryland and, perhaps, elsewhere in the 13 ‘New England’ colonies. In England, although the first groat or fourpence coins issued under Edward I should have contained four pennyweights, or 96 grains, of sterling silver, they actually contained 90 grains of sterling, and later issues became progressively lighter-weight. By the Restoration of King Charles II in 1660, the English groats or fourpence were struck of less than sterling silver and infrequently coined, to a standard of about 30 grains. The Lord Baltimore groats averaged about 22.8 grains of sterling silver but show wide variability. Their much lighter weight than comparable English coins was one of the main objections put forth by the Tower Mint authorities that Cecil Calvert had to overcome. The coin illustrated above is a Hodder 1-A fourpence die type. A hyphen connects TERRAE and MARIAE. T is noticeably shorter and lower at the top than E in TERRAE. A stop shows after MARIAE and before &C, and the right top of the ampersand shows a short right-angle dogleg. The I in MARIAE lacks the right-bottom serif. Many of the I’s lack the bottom-right serif or else it is weak (although they were clearly each hand-engraved rather than stamped from letter punches). The orb is misshaped at the bottom, filling the area left of the central point in the crown. The last I in MULTIPLICAMINI is much lower than the adjacent N.
In November 13-14, 2002, a hoard of 19 sixpence was sold by the auction firm Morton & Eden, Ltd. in London, England. The coins had been discovered in an English country house in a small, cylindrical, silver counter box. The hoard contained a single example of the extremely rare MVLTILICAMINI (Lot 785, “Small Bust, Dies 2-D) variant that sold for the equivalent of $50,432.00 to Stack’s. The Hodder 1-A/Whitman-1080 features a large head and is the more common variety. It is known by only two examples in silver and around five examples in copper. The shield point is between M and U in MULTIPLICAMINI, much closer to M.